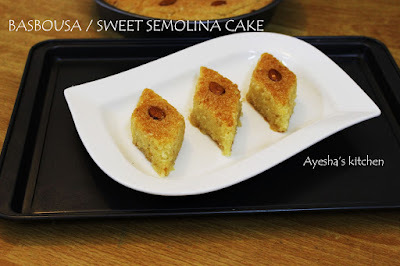 Let's have some sweet dessert using Semolina / Rawa. Its a super easy and delicious sweet cake or dessert called by different names like basbousa / hareesa / ravani. These are perfect with tea or coffee. I am not a sweet lover but still, I need something sweet after my lunch and dinner. Basbousa is just enough to add an extra oomph to the meal. So my basbousa will not be too sugary but still, it is enough to satisfy a sweet tooth. 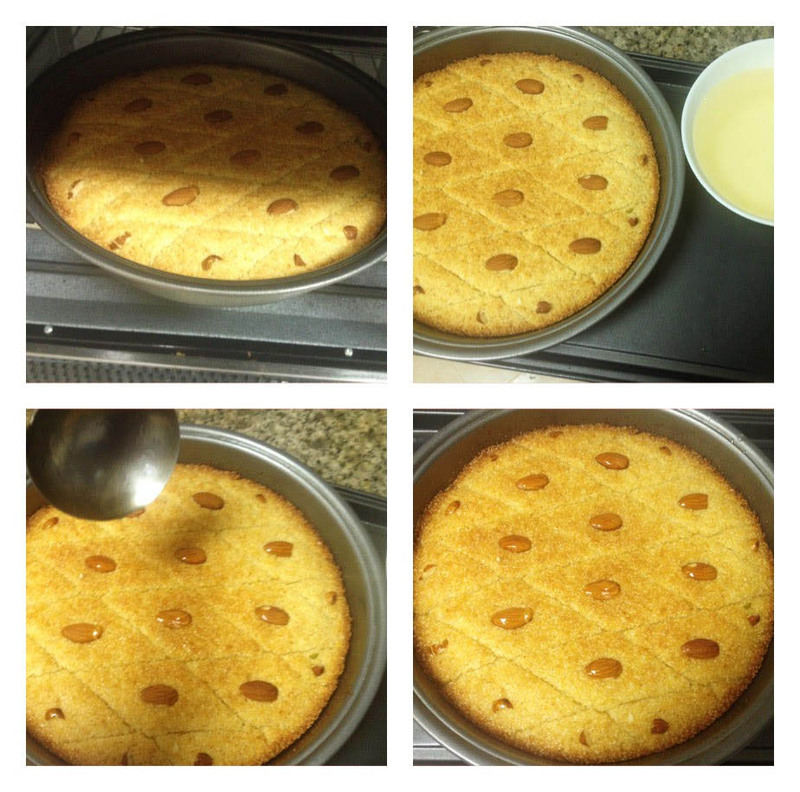 In my opinion, always prepare a normal sugary dessert which makes you crave for more. 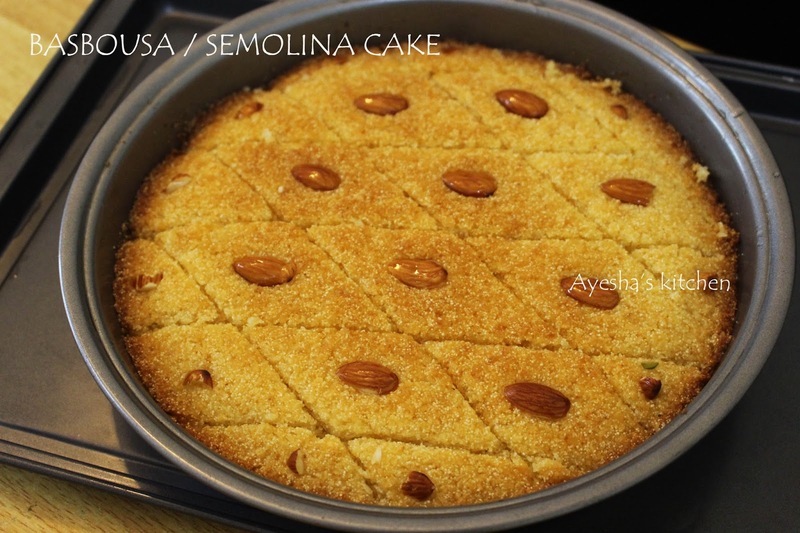 Basbousa is a dessert or sweet cake made of semolina soaked in sugar syrup. 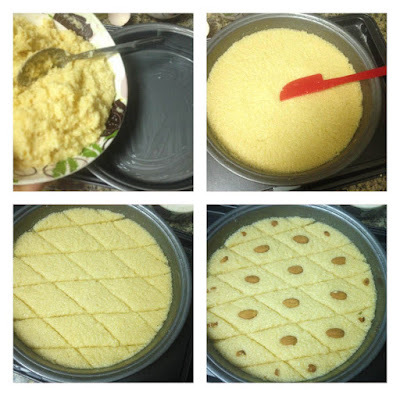 It appears to be a variant of Egyptian dish/dessert mamounia . Basbousa is a traditional and common Middle eastern sweet cake. Semolina or farina is the main ingredient in the preparation of Basboosa along with desiccated coconut which is a popular addition. It has many regional names like basbusah, harisa in arabic ..... shamali in Armenian....nammoura in lebanon...revani or ravani in Turkish...gabelouze in French and so on. It is mainly found in the cuisines of middle east and Horn of Africa. It can be prepared in different ways like using curd or milk or with egg or without egg. 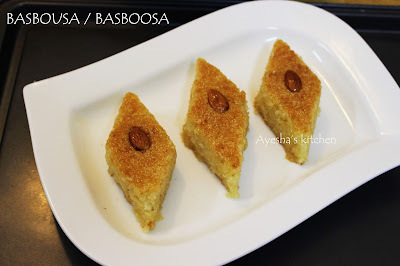 Here am sharing the recipe of basbousa using whole milk and egg. Let's see how to make basbousa with egg and milk / how to make semolina cake. Here is the video . Please watch and subscribe. Take a bowl and add semolina (rawa), desiccated coconut, sugar, baking powder and all purpose flour (maida). Mix well. Combine egg, milk (mix saffron strands), ghee or butter in another bowl. 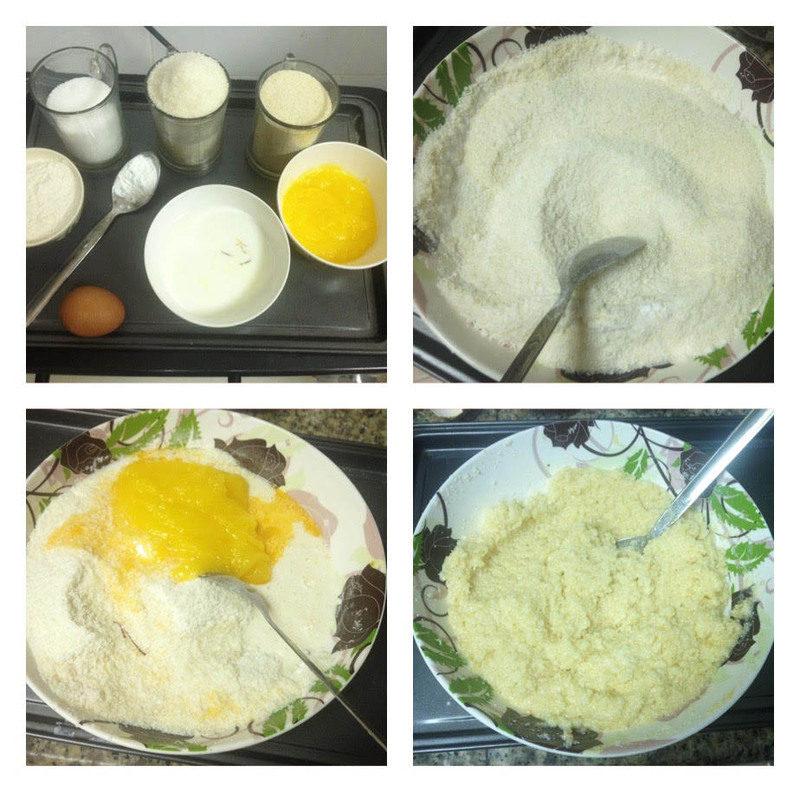 Add this mixture into the dry ingredients. Combine well to a smooth and soft dough. Butter a baking tray and put the dough into that tray. Spread it evenly and level it well with a spoon. Pre cut the top of prepared dough mixture and make diamond shapes. Bake in a preheated oven until the top becomes golden. Bake for 25 minutes at 180 degree C. The baking degree changes according to the oven used. So bake same like you bake cakes. But the time needed is 25 - 30 minutes only. Meanwhile, prepare sugar syrup. Heat a pan and add sugar, water, lemon juice. Cook it for five minutes. Pour this syrup over the basbousa immediately once the basbousa gets ready. If you want less sugared basbousa, pour the syrup accordingly but the basbousa must be wet enough. Allow it to cool for 20 minutes. Serve after 2 hours. You can chill it in the refrigerator and then cut properly and serve. Before serving keep it out of the refrigerator.